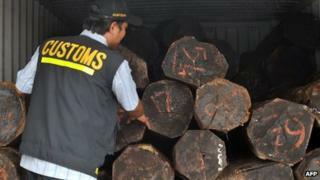 The EU is introducing new checks on imports of Indonesian timber products to curb illegal logging. Indonesia, rich in tropical forests, is by far Asia's biggest exporter of timber to the EU. The trade is worth about 15% of Indonesia's total exports. The EU will provide technical support to help Indonesia ensure that only legally harvested timber is exported. Environmentalists welcomed the new agreement, but said Jakarta must do much more to fight illegal loggers. The scale of deforestation in Indonesia has triggered global concern, as it reduces biodiversity, threatens rare species and creates harmful smog through the burning of vegetation. The EU is Indonesia's biggest export market for timber, with Germany, the UK, France and Italy among the major importers. The European Commission says the Voluntary Partnership Agreement (VPA) with Indonesia commits both sides to trade only in verified legal timber products. Indonesia exports processed timber, in the form of paper, wooden furniture and plywood. Indonesia's rainforest is reckoned to be the third-biggest in the world, after those in the Amazon and Congo basins. From now on, only Indonesian timber compliant with the EU's verification system, called Forest Law Enforcement Governance and Trade (FLEGT), will be imported into the EU, the Commission says. The regulations require Indonesia to trace the timber's source back through the whole supply chain. Independent auditors will be brought into the timber industry. The Indonesian government has set up a verification system, known by the initials SVLK. European timber merchants are also obliged by law to sell only legally harvested timber, under the EU Timber Regulation which took effect in March. The EU already has VPAs with Ghana, Cameroon, Congo-Brazzaville, Liberia and Central African Republic. VPAs are being negotiated with several more African and Asian countries. A London-based environmental group, the Environmental Investigation Agency (EIA), praised the VPA with Indonesia, noting "the formal role for Indonesia's civil society in monitoring the compliance of the country's timber industry". But the EIA's Faith Doherty also said the agreement would test the Jakarta authorities' resolve to tackle corruption in the industry. "It does not mean that there is not a substantial amount of work still to be done," she said. Bustar Maitar, a Greenpeace campaign director in Indonesia, welcomed Monday's agreement, but said "there is still much work to be done if Indonesia's timber legality standard (SVLK) and system are to be credible". "Indonesia must take steps to improve enforcement such as prohibiting forest conversion for industrial timber plantations and ensuring transparency and access to relevant data and maps," he said. Has the EU fallen for Congo rainforest logging scam?